Over 40 Amateur Of The Week: Mass Production Past Age 40! Karl is more than a super ripped 42-year-old. 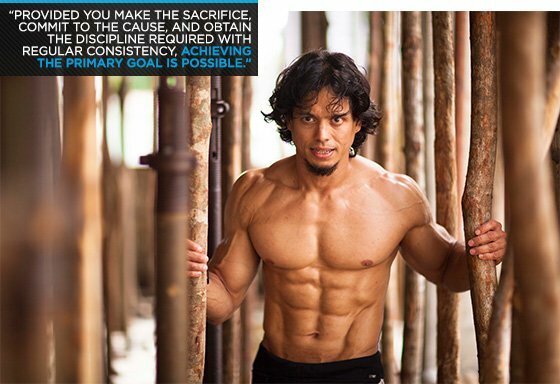 He's a fitness ambassador for Sri Lanka who wants to leave an engrained mark on the industry! 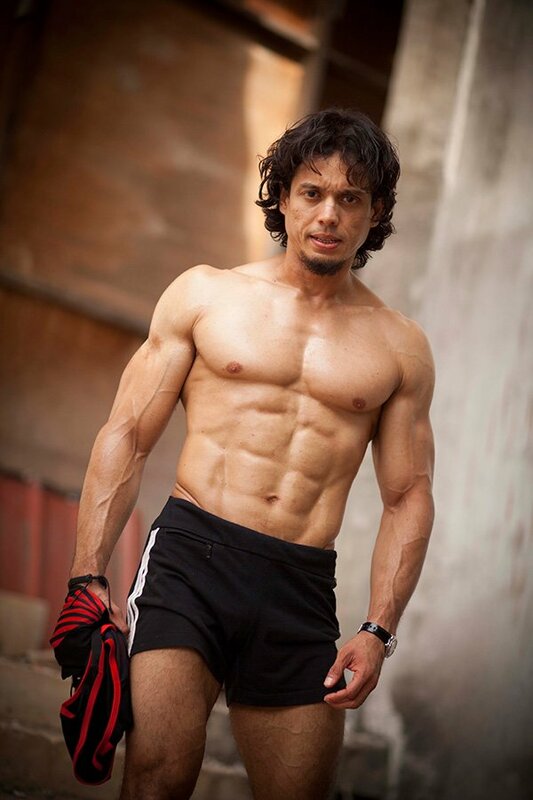 I was never a fitness freak, but my father is an ardent sports enthusiast and always supported any sporting activity at every stage of my life. At age 75, he's up by 6 a.m. and sweats it out on the badminton or tennis court. In school, I swam nationals, captained in rugby, and took part in athletics. In my mid-20s, I decided to start bodybuilding and take up squash and road running. Till then, I took it easy and enjoyed the "good life." I ate and drank anything and everything and fitness wasn't a priority in my life. On the morning of Aug 31, 1996, I took a good, hard look in the mirror. It took me a while to come to terms with my somewhat "neglected" reflection. At that turning point, I made up my mind to make a complete U-turn from my party, happy-go-lucky lifestyle and joined the gym the next day. I totally abstained from alcohol and tobacco, took on a disciplined workout ethic, and used consistent forms of cross training and varied activities to motivate myself and embark on a fitness journey. This multipronged approach continues with the same ethos into my 40s. I follow a six-day-per-week gym routine for about three months per year and hit a single body part for each session/day. I use considerably heavy weights in a 6-10 rep range with four sets of about seven exercises and wrap it up in just under an hour. On Saturday mornings, I do a 32 km (two-hour) mountain biking session and squeeze in at least two sessions of 10 km (one-hour) road runs during the week. I incorporate a 10-minute abdominal floor exercise routine as a warm-up prior to training. I eat anything and everything. However, I try to cut down on carbohydrates or limit it to a minimum at dinner time. I try to incorporate a mixed salad with a variety of colors, which translates to more nutrients. I eat tropical fruit at least 3-4 times per week and throw it into my blender with milk, honey, and peanut butter as a post-workout smoothie. I also include fresh fruit and almonds with my oats/porridge for breakfast. I make it a habit to have lots of nuts and dried fruits in the office and during travelling as munchies. I don't wait until I'm totally famished to have my meal. Water is the best method to suppress "sudden hunger" and continuously hydrate. My passion emerged from the first day I walked into a gym (about 20 years ago). It's also when I first noticed that it's possible to transform and condition the body like a fine-tuned machine. Provided you make the sacrifice, commit to the cause, and obtain the discipline required with regular consistency, achieving the primary goal is possible. The proper tools and nutrition are available to everyone. It paid off big time and the dividends are visible daily. I'm fitter, healthier, and happier with no regrets. My motivation is purely internal. Watching my father's morning routine helped, but, as mentioned earlier, I decided to embark on this journey to balance fitness, nutrition, and work/family life. Where the mind goes, the body follows. I made a commitment to myself at age 24 to make a change to be fitter and stronger. My two children are my inspiration. I want to live long and stay very much alive to reap the benefits and actively participate in their lives. Long-term goals do materialize. At age 24, I believed I could own an "eight-pack" in my 40s. All great athletes are guidance and inspiration. However, it takes motivation from within to be disciplined and do what it takes. Iconic sporting heroes display that it can be done and at the end of the day, it's you who does the hard work. There are no shortcuts or quick fixes. It's an entire package of disciplined workouts, controlled and balanced nutrition, adequate rest, and an occasional cheat/indulge day. My professional life requires that I deal with consultants, contractors, architects, and real estate owners. The entire "chain" associated with acquiring and maintaining new business requires patience and discipline. My ethos helped me maintain a healthy work life balance, and manage stress and deadlines as the CEO of my company. If you have a like-minded gym buddy, 50 percent of your fitness goals are achieved. It helps to know you have someone to watch your back as you push heavier weight. If not for this partner, you will not push that extra bit of weight as you may be overcome by fear of injury and not tap into your full potential. You need to initially identify what you want to achieve and for what application or purpose you want as an outcome. Depending on your body shape and lifestyle, your routine will be a delicate balance between really painful and traumatic or too easy. No one but you can ultimately determine the ideal routine. The information and knowledge you gather will simply show you the way. Arnold Schwarzenegger! From the first day I ever noticed "a muscle" on anything or anyone, it was Arnold. His life and attitude sent him to the top of my list. As many others will agree, his achievements are epic and he is a true icon of the industry. I'm a regular guy with no medals, trophies, accolades, or titles in bodybuilding. I have worked out for more than 17 years and learned lots thanks to Bodybuilding.com—the most informative site for anyone who wants to start or update themselves with the latest news and products in the field. In my opinion, it's by far the most adequately formatted portal for anything related to fitness in the cyber world. To my parents for my genetics. To my beautiful and talented daughter, Tiana, and my athletic and sporty son, Akira, for being the best kids on the planet. To my mammoth gym partner, Harin Gabriel.